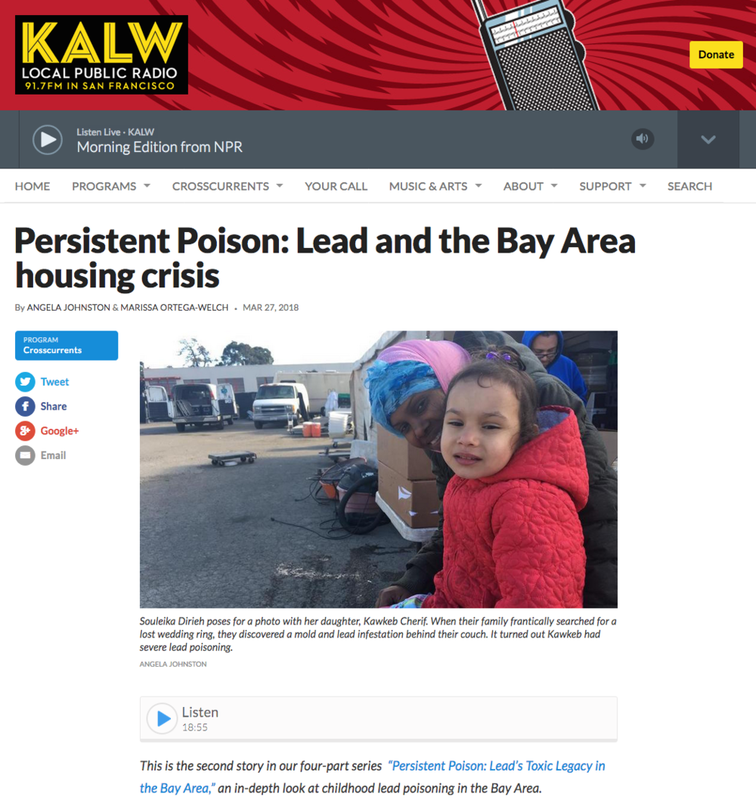 SmartOakland is sharing this KALW series on lead poisoning in case our readers have not already seen it a the source. Thank you KALW for this series! We meet Souleika Dirieh and Tarek Cherif at the hummus factory they own in San Leandro. Their three-year-old daughter Kawkeb loves playing outdoors. When we visit, she runs between empty food crates, deep in a game of hide-and-go-seek with her mom. Inside the factory, the Cherifs and their employees make dozens of different types of hummus. Piles of ripped pita bread sizzle in the deep fryer before being sprinkled with spices, then packaged and shipped off to farmers markets around the Bay Area. Souleika Dirieh stands in front of the hummus shop she and her husband own in San Leandro. They believe their daughter got lead poisoning from an apartment they used to rent across the street. The hummus factory is right down the street from the studio apartment this family used to live in. That’s where their lead poisoning story began, a little over three years ago. Tarek had just opened the business. He worked late nights, sleeping on the couch so as not to disturb his wife and daughter when he came home. He just couldn’t shake the lingering cold. Souleika and Kawkeb got it too. “She was sick for about...six months and she was getting what we might call a cold, sneezing,” Souleika says. It only seemed to go away when they left the house, like when they went on vacation. Then, one day, Tarek realized he couldn’t find his wedding ring. They tore apart the house looking for it, pulling out the dresser and peering down the sink. “We flipped the couch over and everything was green, green and black,” Tarek says. He says rainwater that collected on the roof seeped into their walls and onto the floor. The mold was disgusting and unhealthy, but they were about to discover something worse. “I took my daughter to the hospital just to check her out to see if she had anything –– mold or anything,” Tarek says. The doctors ran other tests, too. The Centers for Disease Control say there is no safe level for lead, but the threshold for intervention is when the blood shows more than five micrograms of lead per deciliter of blood. Kawkeb’s blood registered a lead level of 23, which means it was really high. “She stopped eating at first. She was always crying for no reason. Under her eyes were dark circles, and she wanted only my breast milk and not other food, and she would sleep a lot,” Souleika describes. That unusual behavior terrified her. The doctor immediately faxed Kawkeb’s high results to the county. Diep Tran, the public health nurse, called the Cherifs, and the Alameda County Healthy Homes department came by to inspect the property for lead. The Cherifs say by the time the county inspectors got there their landlord had painted over the mold and the lead, so they couldn’t find any initial evidence. Painting over lead does contain it, temporarily solving the problem and making it undetectable, but here’s what both the Cherifs and the county officials think happened: the mold wore down the paint on the walls, paint that had lead in it, and lead particles made their way into the air, and on the floor, where Kawkeb played. Once they got Kawkeb into the county’s lead reduction program, the Cherifs moved out temporarily, staying with family while the landlord said he finished up the repairs. However, as soon as they moved back in, Tarek says the same problem started again. Kawkeb’s lead levels didn’t go down like they should, and the whole family started to get sick again. Tarek says, because he could tell the mold and lead weren’t really gone, he called the landlord. “I took him inside the house and I showed them the same problem again,” Tarek says. “He wanted to move me to another apartment.” It was a neighboring unit in the building. Tarek wanted the county to come and inspect that unit, too. “I told him before I could move to another apartment, I'm going to bring in a whole team and test the place and then I'll move. If it's safe, I'll move. And I think that's what actually triggered everything. He evicted us right after that,” Tarek says. The Cherifs claim their landlord evicted his family because they started to put up a fight. They’ve sued their former landlord for wrongful eviction and a host of other habitability claims. Basically, they allege their apartment wasn’t safe to live in. “The same day he kicked us out he had another family move into the apartment. He didn’t even clean it. He didn't do a thing. Nothing. I mean we moved out at midnight, and a new family came in at 8 a.m., and they were already in the apartment,” Tarek claims. We spoke with the lawyer for the Cherifs’ former landlord and the property management company. He said he can’t comment because the case is ongoing, but that his clients “categorically deny any and all of the Cherifs’ claims,” and have not seen any evidence with merit. Tarek Cherif says he’s worried someone else will get sick staying in his old apartment building. The Cherifs paid just under $900 per month for their old place. The fair market rent for a studio in Alameda County is just over $1500 and many go for more. When they searched for a new place in San Leandro near Tarek’s hummus shop, they couldn’t find anything. Eventually, they moved to Milpitas, a 40-minute drive away, into a house they share with Tarek’s brother’s family. Seven people live together. “The children, they have their rooms. We have our rooms, they have a garden where the kids can play,” Tarek says. Their rent nearly quadrupled, but the house is safe. Tarek says he had it tested as soon as he moved in. More importantly, he says, Kawkeb’s acting like herself again. Her lead levels have gone down significantly, too. For a family dealing with a lead-poisoned child, the Cherifs were actually lucky. They had a safety net, some savings, and family they could move in with. What happens to the families that can’t take a risk, that can’t complain about their living situation? "I put them in a homeless shelter, because once they are in the shelter, their chance of getting hopefully affordable and lead-safe housing jumps up." - Diep Tran, public health nurse for Alameda County's lead poisoning prevention program. Or, she says, some families move to Stockton, Antioch, Vallejo, or Concord — suburbs on the edge of the Bay Area with cheaper, newer homes that don’t have lead paint. “They move in with a relative, and as soon as they move out of that place their child’s blood level drops,” she says. Diep says with many of her cases she strongly urges families to move if the lead problem is too difficult to fix or the property owners can’t be persuaded. State laws dictate landlords must maintain the property — including addressing lead hazards if there is a lead poisoned child. Diep says landlords can claim that they want to sell the property instead. Then, the homeowners can rent to someone who can pay more, or sell the property altogether. She says sometimes this type of gentrification can result in lead cleanup. The lead is gone, but that only benefits wealthier people, she says. The Cherifs were lucky to have family in the Bay Area, but Diep says most people are forced to move away from their relatives and friends. “They are forced to move away from their support system, but at the same time the housing stock in Stockton, Vallejo and Concord may have fewer lead hazards." - Diep Tran, public health nurse for Alameda County's lead poisoning prevention program. In Alameda County, there are over 400,000 homes built before lead paint was banned in 1978 — hundreds of thousands of chances a child could get lead poisoning. As Souleika Cherif points out, that older housing stock often ends up going to people who have fewer resources to deal with problems like lead. She says she thinks sometimes landlords even rent to immigrants or refugees for this reason. To follow up on her hunch, we called a handful of Bay Area fair-housing agencies. They told us they’re seeing an alarming trend in the Bay Area: clusters of refugees and immigrants in unsafe housing. That practice of landlords taking advantage of people they know won't be able to fight back is called predatory habitability. Alameda County's public health department put together this lead poisoning heat map that accounts for several risk factors like race, poverty level, education, and age of homes. There is a higher risk of lead poisoning in the darker areas. The Cherifs came to the U.S. from Africa: Soulika from Djibouti and Tarek from Tunisia. “You know, most of the time I don't hear American kids got lead,” Souleika remarks. Lead paint from old houses causes the majority of lead poisoning cases in Alameda County, but the county says different ethnic groups bring in their own products that contain lead: some turmeric from India or eye make-up from Afghanistan. These lead-based products can make kids really sick, too. As the number of immigrants to the county increases, so does the number of different ways kids can get lead poisoned. Soulika and Tarek said before county inspectors came to look at the house, the questions from Diep came at them like gunfire, one after the other. What products did you bring back with you from Africa? Did any of them have lead in them? How do you put her to sleep? What do you give to her as food? How do you take care of her? They felt Diep and her team automatically assumed that because they are immigrants, African immigrants in particular, they caused Kawkeb’s high lead levels. “Instead of saying, ‘This is the place where you were living,’ they were asking ‘Maybe using cultural traditional things, makeups like...kohl,’” Souleika says. Kohl is a type of eye makeup used in Middle Eastern countries, applied on and around children’s eyelids to ward off bad spirits. Some brands have extremely high concentrations of lead. But Souleika says, they didn’t use kohl on Kawkeb. It’s actually not part of her tradition. “They assume because I came from East Africa, because we're Muslim and Muslims use this as a tradition,” that they used kohl on Kawkeb, she says. She said at first, she felt that Diep and her colleagues at the lead poisoning prevention program blamed them and their culture. She was worried she’d get in trouble for something she didn’t do. “She told me that if you are not educated or if you did not go to school and so on, I will be watching you and calling you all the time,” Souleika says. We asked Diep about this, how she navigates families’ culture and traditions while addressing their safety. Diep sticks to a questionnaire written in 2004 by the California Department of Public Health’s state lead program. She says it hasn’t been updated since. She starts flipping through hers and shows us. Diep says if Souleika and Tarek were offended by her questions, it’s because she was following that script. “They may be from Afghanistan, but the child may be born in New Jersey or whatever. You go down the list. You ask them things like, ‘Have you ever lived in a house with peeling paint, used eye makeup?’ Depending on the culture...if I interviewed a Mexican family or an American family, I would not ask that,” Diep says. She says, she sees some families shut down. “I watch the body language, and if I can tell if they are offended, I will ask them ‘Do you have any questions?’ You have to let them know that they are in charge, and you are a guest, so if they want to end the visit, that's okay,” Diep says. At the end of the day, Diep works for a government program that’s under-resourced. Diep says she has to do her job so she can move on to the next family as soon as she can. We circle back to the Cherifs. Despite their initial challenges with Diep, they’ve still worked with her for three years. Do they still feel like she’s blaming them? This is part of our series “Persistent Poison: Lead’s Toxic Legacy in the Bay Area.” To find a list of resources on lead poisoning, click here.